Skillet-fried corn is a Southern favorite and is a go-to recipe when corn on the cob is at its peak. This recipe is different from creamed corn, another popular dish from down South, in that it does not include any milk or flour. 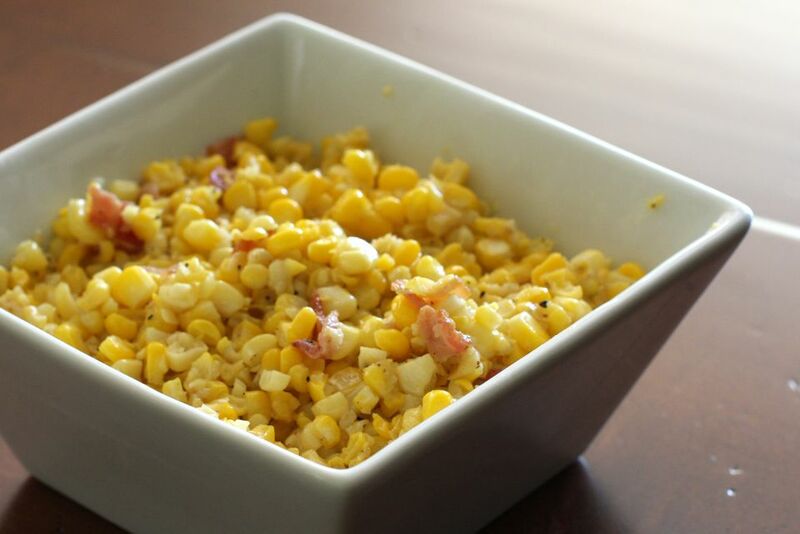 Instead, this savory side dish boasts bacon drippings, a nice counterpoint to the to sweet corn. You do need fresh corn for this recipe, so it is best to wait until summer when it is in season. If you don't want to use bacon drippings, you can replace those with butter—or use a combination of the two fats. If your corn is very fresh and sweet, you can cut back on the sugar or omit it altogether; however, a little sugar really brings out the natural sweetness of the corn, so adding some is a good idea. Fried corn goes well with pork or ham, or serve it with grilled steaks or Southern fried chicken. Slice the corn from the cob. Scrape the cob downward to get any remaining corn and juices left near the cob. Heat a heavy skillet to medium-high and add the bacon fat or butter. If using butter, lower the heat to medium-low and watch carefully so it doesn't burn. When the fat is hot, add the corn. Continue cooking for 15 to 20 minutes, stirring frequently. Sprinkle with the salt, sugar, and pepper. Cook for about 2 minutes longer. Cutting corn from the cob can be a messy job, but by using a simple method you can keep all of those stray kernels in one place. The ideal piece of equipment is a tube or Bundt cake pan. If you don't have either, you can place a small bowl upside down inside a larger bowl. Stand the cob so the pointy end sits inside the hole of the tube or Bundt pan, or, if using two bowls, place the flat end on the back of the small bowl. Starting at the top of the ear, use a serrated or sharp knife and cut downward, as close to the cob as possible, removing the kernels and letting them fall into the pan or bowl. Continue, rotating the ear, until the cob is clean. Give the corn some Mexican flair by including a few tablespoons of minced red and green bell peppers and minced onions. You can also turn up the heat with a few teaspoons of minced jalapeno peppers or a dash of cayenne pepper. Add a few tablespoons of fresh chopped parsley or cilantro along with the salt and pepper for extra color and flavor. For additional flavor, add 2 to 3 tablespoons of thinly sliced green onions to the skillet with the corn. Add a few tablespoons of crumbled cooked bacon just before serving. Cajun maque choux is a traditional Southern dish originating in Louisianna that is very similar to fried corn. To make, saute 3 tablespoons of chopped onions and 2 tablespoons of chopped bell pepper in bacon fat or butter before adding the corn. Add the corn and cook for 5 minutes. Add 1/3 cup of milk, a pinch of cayenne pepper, and salt and pepper. (Omit the sugar for this recipe.) Continue cooking for about 10 to 15 minutes.